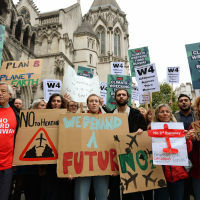 Campaigners are protesting outside the High Court in London as the legal challenge against Heathrow Airport's controversial expansion ramps up. Several groups - including local councils, residents, environmental charities and politicians - are challenging the Government's decision to approve a third runway at the airport. Dozens of campaigners staged a demonstration outside the Royal Courts of Justice earlier this week ahead of a pre-trial hearing. Caroline Russell, a Green Party London Assembly Member, said there are a significant amount of reasons in terms of air pollution and noise pollution that Londoners might oppose the expansion. Speaking outside the court, Ms Russell said: "The most important reason is climate breakdown and if we now press ahead with any expansion ... we will be utterly failing in our global responsibilities to our planet and the people who live on it." She added: "Obviously, today everyone is thinking about Brexit, which is one of the most divisive and catastrophic events to take over our politics. "But if we don't take climate change seriously, the political catastrophe that we will face is as nothing compared to what we are facing now." In a statement ahead of the hearing, Laura MacKenzie from Friends of the Earth said: "The Government should never have entertained the idea of a climate-wrecking third runway, with Heathrow already the UK's single biggest source of emissions. "The Government should cancel the third runway and adopt fair and equitable policies to keep aviation demand within environmental limits." At the hearing, environmental charities Plan B and Friends of the Earth will ask Mr Justice Holgate to order that the substantive two-week hearing, which begins on March 11, be streamed live. Transport Secretary Chris Grayling said the new runway would set a "clear path to our future as a global nation in the post-Brexit world". A Department for Transport (DfT) spokesman said: "Expansion at Heathrow is a critical programme which will provide a boost to the economy, increase our international links and create tens of thousands of new jobs. "As with any major infrastructure project, we have been anticipating legal challenges and will robustly defend our position. "Today's hearing does not delay the work Heathrow is undertaking on its application for planning consent or the timetable to deliver this much-needed runway." If you're planning on flying out of Heathrow this year, make sure you have the right cover by taking a look at our diverse travel insurance options.